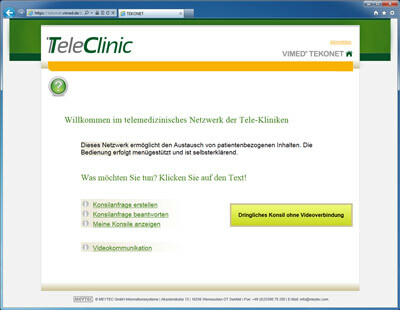 VIMED® TEKONET is a server-based telemedicine platform. The system is built for the use during the telemedical consultations. Even in emergency mode the telemedicine portal provides a prompt access to all relevant medical information. VIMED® TEKONET enables the direct processing and documenting of the essential and comprehensive findings data of the physicians consultations. To secure the communication between the participated medical professionals, the complete transmission of sensitive data via VIMED® TEKONET is exclusively encrypted. VPN connection is established between all participating consulting partners. VIMED® TEKONET makes it possible to individualize the design of the experts networks and to manage them enabling the physician’s decision and confidential patient information to be exchanged and accessed with the required authentication. Co-operative diagnostic procedure of the ultrasound pictures from a catheter system by experienced colleagues, etc. Access to the portal secured via password and can to be accessed only via a login for authenticated users. The inclusion of the multiple medical departments makes the universal use within the hospital network possible.